Four examples of external and internal flow simulations are presented. 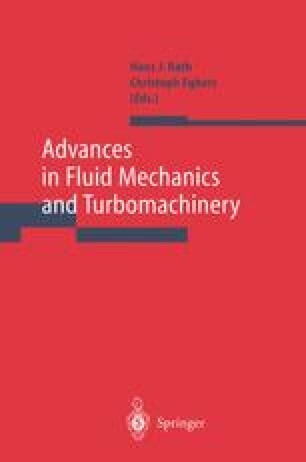 The first simulation reported exemplifies the computation of steady supersonic flow with a freestream Mach number of M a=3.8 around a model of the space transportation system ELAC 1, including the chemically reacting flow in the exhaust nozzle. The flow around the configuration is predicted with a numerical solution of the parabolized Navier-Stokes equations for laminar conditions, while for the prediction of the nozzle flow the Navier-Stokes equations are solved in the symmetry plane of ELAC 1 under the assumption of chemical equilibrium. The second example demonstrates results obtained with large-eddy simulations of internal and free turbulent flows. Examples are presented for turbulent flows in bended pipes, pipe junctions and mixing processes in jets and jet apparatus. The difficulty of prescribing suitable inflow conditions for the jets was circumnavigated by obtaining velocity and density distributions from fully developed pipe flows. The third example is concerned with the simulation of the unsteady, three-dimensional, compressible flow in a cylinder of a four-valve piston engine during the suction and the compression stroke. The vortex structures generated during the intake stroke were simulated with a numerical solution on a boundary-fitted, block-structured moving grid. The fourth example shows results recently obtained in numerical simulations of a locally unsteady, incompressible swirling laminar pipe flow, bursted in a bubble-type breakdown. This flow was simulated with a dual-time stepping technique, based on the concept of artificial compressibility.